Before the dangers of asbestos were fully understood, it was an attractive building material because it offered high fiber strength as well as fire-resistant properties. However, we now understand the respiratory dangers of asbestos. If a person is exposed to airborne asbestos fibers, he or she may develop serious lung problems, including lung cancer. This is why demolition contractors and others involved in the building trade must be extremely careful when taking down buildings that contain asbestos. Textured coating on walls and ceilings. Wall paneling, especially around windows. In and around fuse boxes. Cavities inside walls and floors. Because asbestos is such a hazardous material, several national agencies have established safety requirements for working with it. For instance, building owners and demolition contractors must notify regional EPA offices before demolishing or renovating buildings that contain high levels of asbestos, according to the asbestos National Emissions Standards for Hazardous Air Pollutants (NESHAP). EPA inspectors carefully examine job sites, analyzing demolition methods as well as physical onsite evidence of asbestos abatement compliance. Beyond asking basic questions about whether your demolition contractors meet the asbestos abatement requirements described above, you can look for exceptional training programs to find the best industrial demolition partners. Look for companies that consistently train employees on safe demolition methods. The best demolition contractors are experts at working with different kinds of hazards, and they prepare their workers for this aspect of industrial demolition. Here at Elder Demolition, we go above and beyond basic EPA asbestos abatement requirements by consistently educating our employees beyond OSHA standards. This entry was posted in Elder Demolition News, Green Demolition, Industrial Demolition and tagged demolition contractors, demolition methods, industrial demolition. Bookmark the permalink. 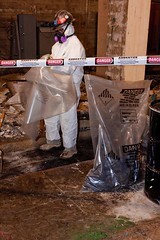 It is very important, when doing demolition on old buildings, to have a good asbestos abatement company on hand to safely remove any harmful asbestos. Because the clean up can be so tricky, it is really important to have experienced professionals doing this cleaning.